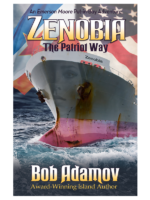 Award-winning Put-in-Bay novelist Bob Adamov has released his eighth novel, Zenobia: The Patriot Way. 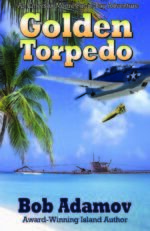 The novel involves human trafficking and part of the proceeds will be donated to Second Chance, a Toledo-based transition center for trafficking victims, and The Human Trafficking Coalition of Lucas County. Human trafficking is much more significant in Ohio than many realize and Adamov uses Zenobia: The Patriot Way to focus enhanced awareness and understanding of this tragic crime against women and children. The novel includes an introductory foreword written by Tasha Perdue, Executive Director of the Human Trafficking Coalition of Lucas County. Adamov also worked with Lucas County Juvenile Court Judge Connie Zemmelman, Detective Peter Swartz of the Toledo Police Department and the Collier County Sheriff’s Office in Naples, Florida as he researched the story of human trafficking. Adamov’s new website www.BobAdamov.com also includes information about Human Trafficking and a short film Shadow of the Heartland. Zenobia continues the popular and growing Emerson Moore series first created by Adamov in 2002 with the release of Rainbow’s End, his first action mystery thriller. Adamov then followed with his string of island bestsellers that include Pierce the Veil, When Rainbows Walk, Promised Land, The Other Side of Hell, Tan Lines, and in 2013 Sandustee. 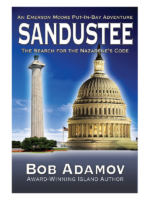 Adamov’s writing style has been compared to internationally acclaimed bestseller authors Clive Cussler and Tom Clancy. 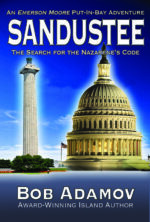 In 1991, a young Emerson Moore is given his first major investigative reporting assignment. He becomes ensnarled in the midst of the Serbian-Croatian war in Vukovar, Croatia. 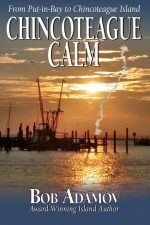 Moore soon finds himself in the crosshairs of the blood-thirsty Serbian paramilitary commander Marko Marinkovic, known also as “the Vuk” (Serbian for “Wolf”), and his wolf pack. While committing heinous atrocities against the Croatians, “the Vuk” becomes involved in international human trafficking and covets a beautiful, young Croatian orphan girl, whom Moore tries to protect. 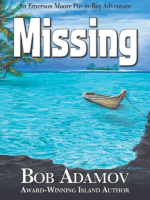 The story advances to present time with Moore enjoying life in the Lake Erie islands resort village of Put-in-Bay when a woman’s murder and the disappearance of two teenagers entangle him in the world of international human trafficking. 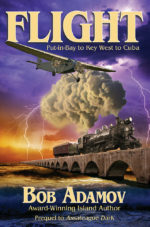 Moore goes undercover in the human trafficking gateway city of Toledo, Ohio and soon finds himself embedded within a vast international criminal network transporting victims along the Interstate 75 corridor to an organized crime boss in Naples, Florida. Moore’s life is further complicated when “the Vuk” resurfaces and is intent on finishing off Moore. From dodging bullets and incoming shells in Croatia to the horrific death of his wife and child in Washington, D.C., Moore rides a roller coaster of emotional twists and turns that plunge him into emotional darkness and despair and then return him to the heights of self-redemption. Filled with an array of colorful characters, Zenobia bursts forcefully with action and intrigue, while at the same time casting attention upon human rights violations that often result from human trafficking.